The Power Wagon series debuted in 1945 and after over 3 decades, the line was discontinued in 1980. 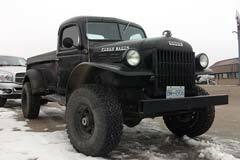 Today, only used Dodge Power Wagons can be acquired. When it was first designed, the model aimed to provide the same utility as some military trucks. Amongst the available choices, buyers could choose between two inline 6 engines, a 3.8 liter and a 4.1 liter version or a 6.3 liter V8. During the production years, all models featured a 4-speed manual transmission. The exterior design of the car was typical to the cars manufactured during that time with a narrow front hood and extra-large fenders. Amongst the models built, the Power Wagon also had a cab chassis which was introduced in 1956. For heavy duty and civilian usage, the automotive manufacturer released a new updated model in 1958. During 1961 and 1971, the manufacturers released multiple updated models with newer front grills and updated body frames. With very few exceptions, the series features 4-wheel drive up till the time it was discontinued. This vehicle is considered by some to be a collectible, so prices will vary greatly. 1973 Dodge Power Wagon Fargo DeSOTO 1973 DODGE FARGO DeSOTO GREEN !!! TRUE SURVIVOR !!! 1989 Dodge Power Wagon Meticulous looking Dodge Power Ram 4x4 Short Bed Pickup. Cold A/C, Amazing !